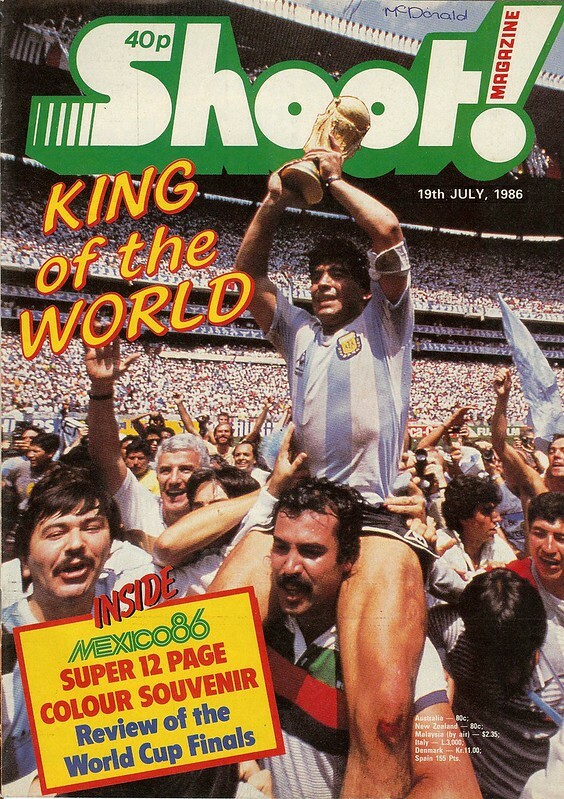 Diego Maradona, held aloft, carrying the World Cup trophy is the cover star of Shoot, as they look back at the 1986 World Cup in Mexico. The editor’s page though, looks at the organisation of the tournament, criticising the standard of sound/pictures on the TV coverage, state of the pitches and standard of refereeing. Elsewhere on the page, he bemoaned the number of British players now playing abroad, asking if stars like Frank McAvennie or Kenny Sansom will be next. 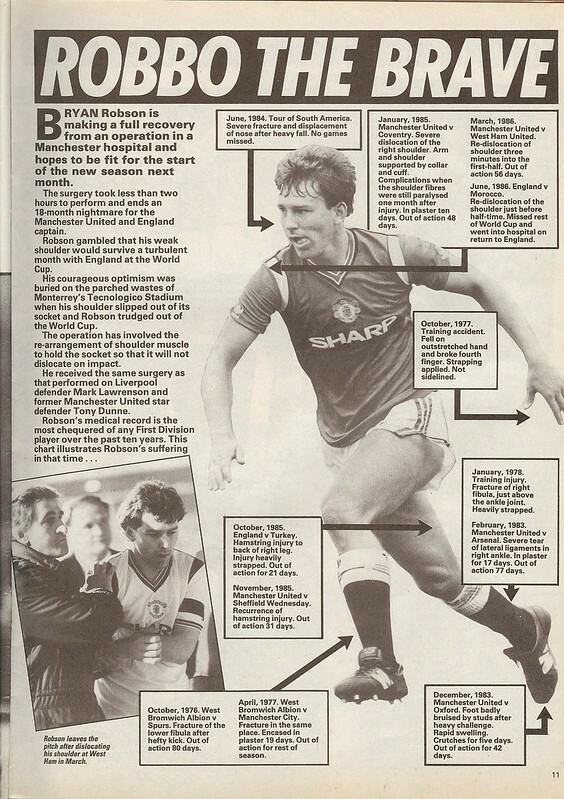 In a recurring theme from 1986 onwards, Bryan Robson has just come out of surgery, and his ready to return for Manchester United, while also appearing in an advert for New Balance boots. There is a free pull-out of a review of the competition, complete with match statistics and line-ups from every game. Line 7 is another boot manufacturer having an advert in this issue, with France midfielder Jean-Marc Ferreri as their Brand Ambassador. I’m no marketing expert, but I think that might need a bit of work. There were three pages dedicated to an unseen victory for England at the 1986 World Cup, learning from their errors at the 1970 World Cup where they weren’t so open to the Mexican public. FA Press Officer Glen Kirton used his A-Level Spanish to Liaise with locals, making sure that England’s time in Mexico ran smoothly. It was pointed out that they had checked out training venues and hotels in Mexico in 1983, as well as a South American tour (1984) and Mexico friendlies (1985) the following summers, as well as players meeting and greeting locals while in Mexico. During the tournament, players had a lot of free time. Gary Bailey spent most of his time reading a book or listening to his Ghetto Blaster. England players made the most of movies lent to them by CBS. 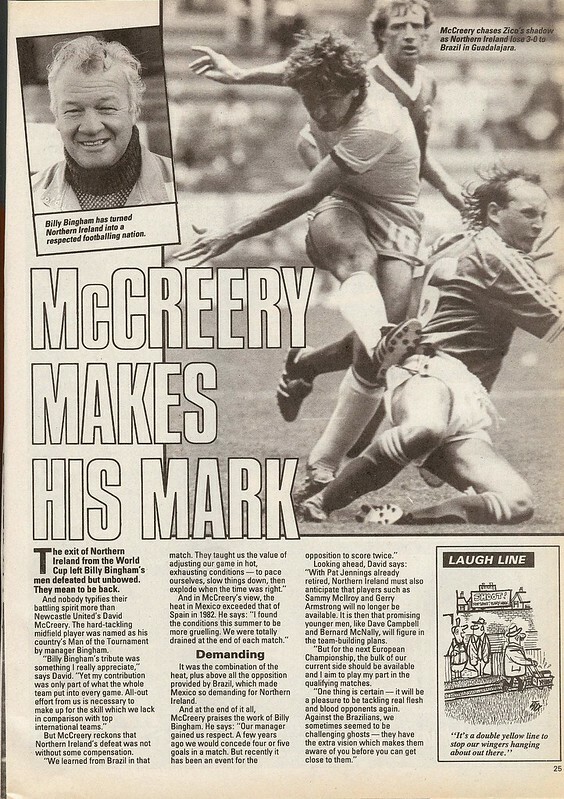 David McCreery gets a full page dedicated to him, as he is interviewed about his experiences of the tournament, having been described as Northern Ireland’s player of the tournament by manager Billy Bingham. A third boot advert, this time Hi-Tec, endorsed by Peter Reid, Steve McMahon and Emlyn Hughes. The boot of Scousers. In Jimmy Greaves Letters Page, one reader asks if Greavsie thinks Bobby Robson is the right man to lead England. Greavsie speaks up in support of Robson, and was proved right as England reached the Semi-finals in 1990. Niki Corrigan from Hartlepool writes in to say that Diego Maradona will be remembered as a cheat. 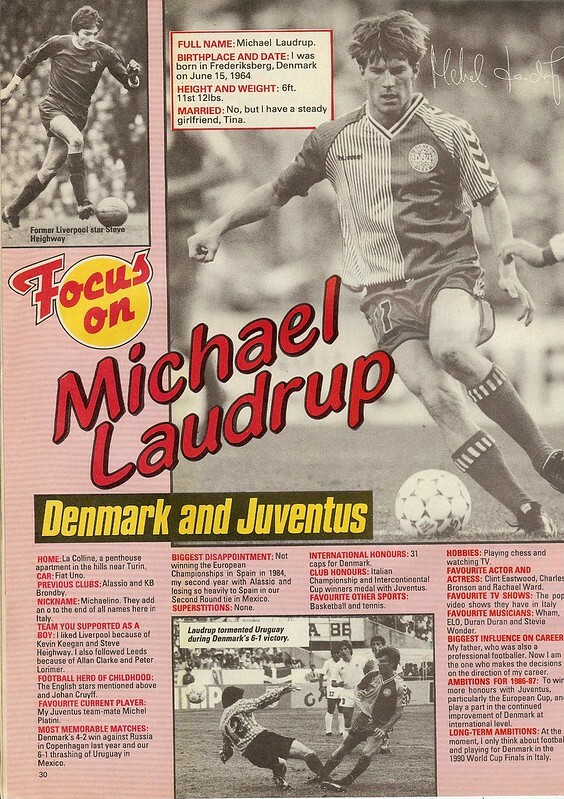 Denmark star Michael Laudrup is the subject of a player profile. He supports Liverpool and Leeds, and his favourite bands are : Wham, ELO, Stevie Wonder and Duran Duran. His long-term ambition was to play for Denmark in the 1990 World Cup Finals in Italy. Unfortunately, Denmark didn’t qualify. 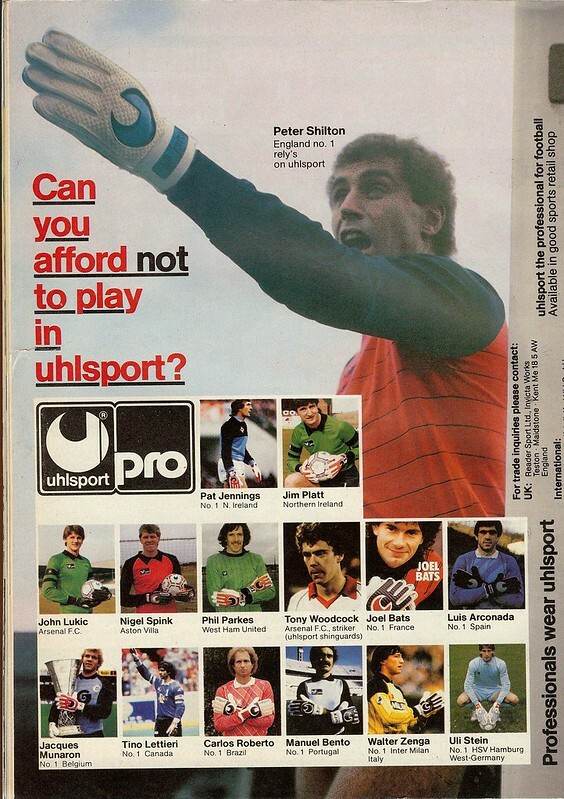 Having had three boot adverts, there was room for one more advert, but it was Uhlsport, for gloves, featuring some of the world’s best goalkeepers such as Pat Jennings, Walter Zenga, Peter Shilton, Joel Bats, and um …… Jim Platt of Coleraine. This entry was posted in Football, Magazine Archive and tagged 1986 World Cup, 1990 World Cup, Billy Bingham, Bobby Robson, Bryan Robson, David McCreery, Diego Maradona, Duran Duran, ELO, Emlyn Hughes, England, Football, Gary Bailey, Gary Lineker, Glenn Hoddle, Italia 90, Jean-Marc Ferreri, Jim Platt, Jimmy Greaves, Joel Bats, Line 7, Magazine Archive, Mexico 86, Michael Laudrup, New Balance, Northern Ireland, Pat Jennings, Peter Reid, Peter Shilton, Scotland, Shoot, Steve McMahon, Stevie Wonder, Uhlsport, Walter Zenga, Wham. Bookmark the permalink.